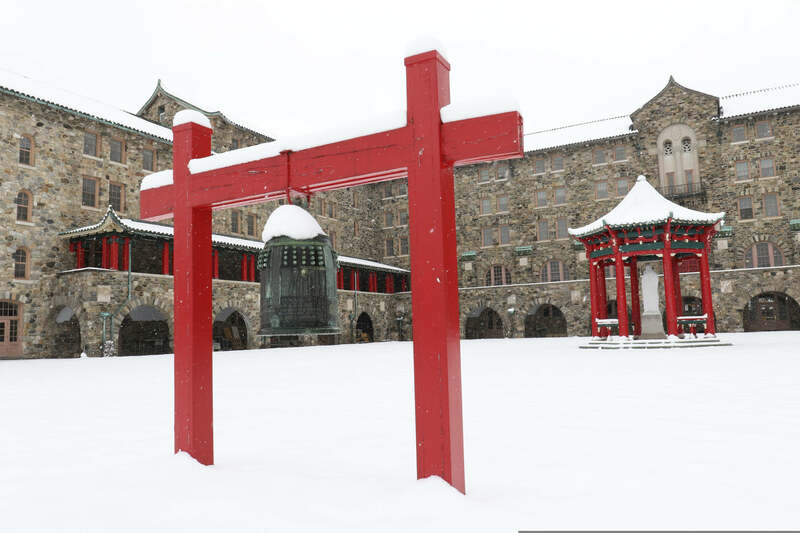 Photo Credit: CNS/Gregory A. Shemit - The departure bell at the Maryknoll Society Center in Maryknoll, New York, is seen during an April snowstorm. The 17th-century bronze bell — which once hung in a Buddhist temple in Japan — was traditionally rung during ceremonies marking the departure of Maryknoll missioners to foreign countries. One of my most extraordinary reporting assignments as a journalist was traveling to the northern regions of Guatemala to cover Maryknoll missioners in action. On one particular trip in 1999, a small band of us rode hours on horseback into the Peten jungle. We journeyed between remote villages that were home to Q’eqchi’ Indians well off the grid. The arrival of a Maryknoll priest every few months to celebrate the Eucharist was cause for great celebration. In each locale, the Mayan people treated us as revered guests worthy of a meal featuring rice, beans, tortillas — and chicken. Meat was costly and rarely served, so our identical meal from village to village was an honoring of our presence. As the only woman on this reporting trip, my fellow travelers insisted that I sleep in the sole hammock. It was suspended between two wooden beams inside the humble, dirt-floored church. As nighttime settled in, I climbed into my narrow berth fully encased in mosquito netting. You can imagine my terror when I awoke at midnight to discover dozens of tarantulas, the size of my hands, camped out across the cinder-blocked walls. I had come to shadow Father John Ruessmann, a 48-year-old Maryknoll priest from Detroit, Michigan, who was ministering to some 11,000 Q’eqchi’ Indians in 95 communities. I expected his routine as a missionary priest to be somewhat predictable: to say Mass, hear confessions and perform marriages and baptisms; and he definitely conducted those Catholic sacraments as we know them. But Father John also carried an unexpected reverence for the sacred traditions of the Mayan people. Because their culture values the wisdom of elders, he would tap them to lead the community prayers. Instead of using standard-issue incense to sanctify the altar, he would burn pom, incense used in Mayan religious ceremonies. After Communion was shared and Mass was concluded, the priest would join the villagers in the ceremony of Mayehak, sharing a ritual drink of cocoa among the congregation, which symbolized their interdependence as a community. I witnessed Father John’s honoring of the dynamic interplay between Christianity and their indigenous practices that have existed for centuries, and it changed my thinking about what it means to be a person of faith in the world. I learned about the importance of meeting people where they are at … of valuing their contributions and staying open to mutual relationship, where others have something of importance to give us. The Q’eqchi pray to the creator for rain, for robust crops, for guidance in raising their children and for solutions to surmount their disagreements, among many things. Their daily attitude is one of completely resting in God in regard to every aspect of their lives. For them, nothing exists outside of this fundamental loving relationship. I departed the Guatemalan jungle with an increased sense of what’s available to me in this most central divine relationship. My guides had gifted me generously. Maryknoll Father John Ruessmann died in 2017 at the age of 65. — Originally published in the Fall 2018 issue of Vermont Catholic magazine.